In addition to the security available from Windows networking, TA✚ utilizes its own security architecture. TA✚ system administrators create customized profiles for each user with selected privileges enabled. When a user signs on, the TA✚ system presents access buttons for only those functions for which the user is authorized. Electronic signature via TA✚ requires an additional authorization (PIN) per CMS guidelines. Keeps detailed transaction logs of all activities including dictating, listening, transcribing, editing, viewing, printing, faxing, downloading and e-signing. 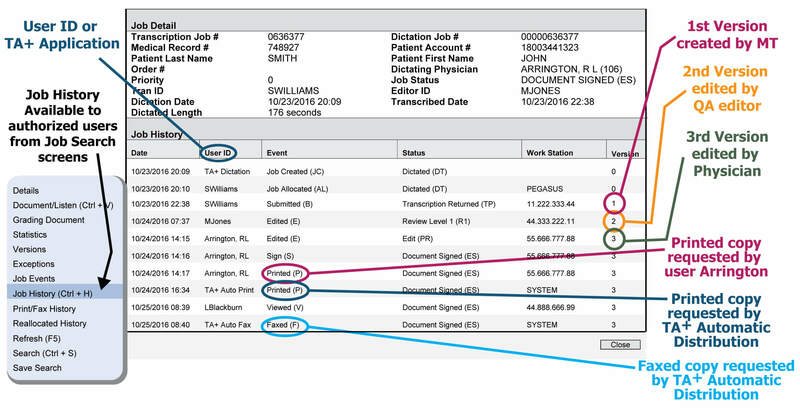 Tracks the integrated physician voice file with the transcript. Displays a sequential log including user ID, activity performed, workstation, time and date, relevant fax numbers and relevant printer ID. Provides transcription document versioning. Authorized TA+ users may view prior versions of a document with each version’s author (editor, transcriptionist, or physician) and time and date of changes. While using personal computers, smart phones or tablets, the patient demographic information, transcripts and voice files are triple DES encrypted and password-protected on the devices. When a user, remote or on-site, logs off from the TA+ system, all transcripts, patient demographic data and voice files are removed from the device, including PCs, tablets and smart phones. TA+ does not use e-mail technology to route documents due to HIPAA. All delivery is accomplished within our secure network environment and tracked including hard copy and on-line options such as HL7 and file drop downloads.